E-mail written 2001 to Warren L. Culpepper from Sarah Lambert Buckmaster. Thomas Alabama Culpepper and D. M. Shelfer on 08 Dec 1902 in Thomas Co., GA.
Tommye Culpepper Shelfer, Leon Co., FL, White, 03 Apr 1884 - 19 May 1976. Jewel Culpepper Long, Cert 31203, Saint Johns Co., FL, White, 01 Jan 1895 - 16 Mar 1981. William R. Culpepper (of Moultrie, Colquitt Co., GA; born 14 Nov 1903; s/o Dr. J. G and Hattie Russ Culpepper of Moultrie) and Cynthia Johnson (of Moultrie, Colquitt Co., GA; born 8 Mar 1907; d/o James [dec’d] and Rosa Smith Johnson) on 9 Mar 1929 in Colquitt Co., GA, Book I-432. William R Culpepper, White, Separated, born 1903 in Georgia, residing in Colquitt Co., Georgia, enlisted as a Private in the US Army on 25 Jul 1942 at Fort McPherson, Georgia. William R. Culpepper, Saint Johns Co., FL, White, Male, died Nov 1963. Russell Aubrey Culpepper, Harris Co., Aug 20 1911, 17872. Ada Inez Culpepper, 26 May 1888 – 23 Aug 1956. Carrie Turman Culpepper, died 2 Apr 1944 in McLennan Co., TX. Ada Inez Culpepper, died 23 Aug 1956 in McLennan Co., TX. Aubrey Culpepper, 24, of China Springs (McLennan Co.), Texas, born 20 Jul 1892 in China Springs (McLennan Co.), Texas. 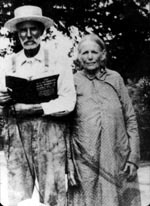 Farmer for H. B. Culpepper of China Springs (McLennan Co.), Texas. Single, Caucasian, no dependents, and no prior military experience. Medium height, stout build, light brown eyes, black hair, not bald, and no disabilities. Registered 5 Jun 1917 in McLennan Co., Texas. Aubrey John Culpeper, Male, born __ 1927 in McLennan Co., Texas, child of Aubrey John Culpeper and Irene Costin. E-mail written March 2006 to Warren Culpepper from #10133) Diedre Bush West (ggd of Cordelia Garrett Turman, e-mail address. Jessie L. Penny, Boarder, M, 32, S, TX MS AR, Farmer. Robert David Culpepper, McLennan Co., Nov 29 1938, 51829. Sarah Allie Rozell Culpepper, 1880 – 1953. Miles Gammill, Male, died 21 Oct 1978 in Bexar Co., TX. H. B. Culpepper, born 1917 in Texas. Resides in Harris Co., TX. Enlisted 15 Jan 1946 at Greensboro, NC as a Private First Class in US Army. 2 Years of High School. Employed as a Vocational Counselor. Married. Weighs 210 lbs. ED 44, sheet 3, line 48.